Our social and relationship resources refer to the network and relationships we have with our stakeholders. Our aim is to create value in each step of the stakeholder engagement process. For more information, refer to our key relationships, and chairperson's review. For more information on our relationships with tenants, see our key relationships, and manufactured resources. The team focuses on a close and proactive working relationship with our tenants to understand and respond promptly to their business needs. We follow a tiered approach, with tenant feedback being escalated from property manager/general manager to heads of property and asset management to our COO. 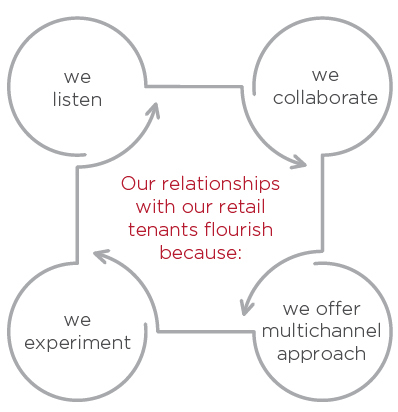 We believe fostering good relationships with our tenants underpins continued, mutually beneficial business. We have consolidated our deal-making team for office and mixed-use into the asset management team. Debbie Theron, as head of property and asset management: office and mixed-use, heads up this team. The benefits of this consolidation is alignment of interest between the deal-making team and the asset management team in terms of lease terms and conditions, the long-term financial impact and sustainability of a deal as well as improving our relationship with our tenants. Jackie van Niekerk met with key tenants and retailers over the year. Discussion points at these successful meetings included expansions (eg Dis-Chem and Woolworths), business operations and new opportunities. We annually appoint independent consultants to conduct tenant satisfaction surveys on our mixed-use and commercial portfolios that help us understand their views. This year, the general tenant satisfaction score increased to 7.5 (2017: 7.4) out of 10, with specific actions to be taken to improve these levels. The rising cost and availability of electricity and water remain a challenge for us and, in turn, for our tenants. Electricity accounts for 11.2% (2017: 12.1%) of the occupancy cost of a building, increasing the burden on our tenants from whom we recover these costs (see natural resources). Our social media platforms were reviewed during the year and we are determined to keep these channels of communication open. We have a slow but steady increase in followers and engagements on our social media pages. It provides us with a platform to promote and share digital news articles and media releases that are located on our website, thereby increasing traffic to the website. We are committed to constantly improve our communication through social media. Our communities are of utmost importance to us, as their growth and stability underpins our business sustainability. Our corporate social investment is focused on education and training in order to address skill shortages in the industry. During the year, our employees invested 309 hours (2017: 483) of their time in corporate social investment programmes reaching 2 337 direct beneficiaries (2017: 1 800) and 11 650 indirect beneficiaries, supported by R6.8 million (2017: R4.4 million) from our company. 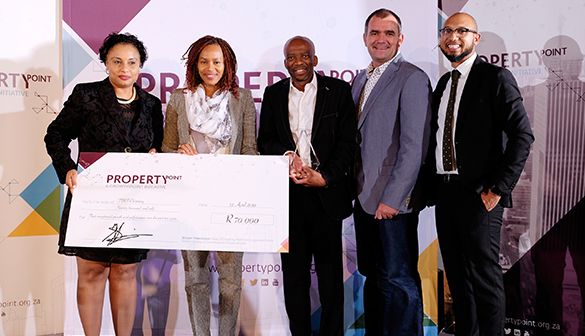 As small businesses are critical to a thriving economy, we continued our relationship with Property Point, a Growthpoint initiative that develops upcoming black entrepreneurs. In March 2018, we celebrated the graduation of five participants who entered the second Attacq Property Point programme in July 2016. The programme, with eight original participants, was conducted over two years and participants concluded contracts to the value of R82.7 million. The five successful participants or businesses collectively created employment equivalent to 295 full-time positions. Our third Attacq Property Point programme, consisting of nine businesses (seven based in Gauteng and two in the Western Cape), began in March 2018. Smaller businesses often struggle to access capital, prompting us to grant R2.6 million in long-term loans and R500.0 million equity for six small to medium enterprises. These three-year loans are monitored quarterly on specific criteria, eg financial performance and employment growth. Through the Attacq Foundation, we invested R340 000 in Columba, a non-profit organisation focused on education, and we contributed R200 000 to the Women Property Network's bursary programme that awarded 29 bursaries to black female students in the property sector. Our malls have participated in various projects such as the #keepaGirlChildInSchool, Stellenbosch CAN and Attacq the Future. As key roleplayers in their communities, the malls plays a vital role in driving social programmes. As a Nation Builder member, we understand our contributions must have real and lasting impacts. Nation Builder is a platform that brings roleplayers together for greater impact, with resources, tools and a community to help companies ensure their CSI is effective. We use Nation Builder's good giving benchmarking tool to monitor our year-on-year improvement. Our overall score for 2018 is 72.0%, slightly down from 2017 (73.0%). We scored best (89.0%) for implementing projects, while our CSI positioning and governance were indicated as areas for improvement. Our commitment to transformation and strategy to align with the amended property sector codes enabled us to achieve a level 2 B-BBEE rating, which allows our tenants to claim 125.0% B-BBEE procurement recognition. Converting to a REIT will affect our B-BBEE rating, given two additional scorecard elements. Our team is working to ensure that the impact of these new pillars does not adversely affect our scorecard in future. Our B-BBEE scorecard was verified by Siyandisa Verification Solutions and is valid until May 2019.